FS1-X is the next evolution in frame synchronization and conversion. 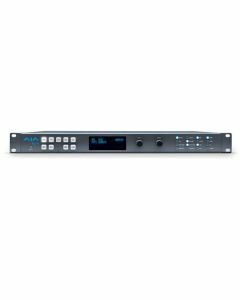 Within its compact 1RU chassis, FS1-X integrates an amazing array of video and audio connectivity and processing, including 56- and 64-channel MADI audio over coax or fiber. With its flexible architecture, FS1-X utilizes a high-quality, motion adaptive linear Frame Rate Converter for smooth motion conversion between a wide range of frame rates whether for broadcast, production or live events. The growth of 5.1 and 7.1 audio has increased the number of audio channels that must be managed in a production as well as needing to create stereo mixdowns from 5.1 and 7.1 sources. The MADI standard provides a convenient way to transport huge numbers of audio channels along a single cable, simplifying the cabling demands for broadcasters, mobile trucks and production. FS1-X supports both fiber and coax 56- and 64-channel MADI input and output. An internal 224x224 audio matrix allows full routing of MADI, mixdowns and all audio coming from SDI, fiber, AES and analog sources for an incredible amount of audio processing capability in a single box. FS1-X is loaded with comprehensive I/O for converting between the widest range of analog and digital signals. Perfect for use in all broadcast and post production environments, featuring 3G-SDI inputs and outputs, HDMI, comprehensive multi-channel audio connections supporting the latest standards, and I/O for analog video equipment, including HD and SD component. The FS1-X supports a wide variety of video formats and connectors, as listed below. The FS1-X has two standard SDI video inputs and outputs, and two optional Fiber video inputs and outputs. All SDI video inputs and outputs, including Fiber, are YCbCr 4:2:2 pixel format. The HDMI input only accepts SMPTE video formats, and accepts embedded audio. Video input formats are RGB or YCbCr 4:2:2 pixel format for consumer video scan formats. Computer scan rates are not supported. The Component Analog Input accepts YCbCr 4:2:2 pixel format, configurable to SMPTE or Betacam levels. If the composite input is used, the component input is not available. The FS1-X composite analog video input/output formats are listed below. If the component inputs are used, the composite input is not available. Lights the relevant alarm LED on the front panel (FMT ERROR, 1 or 2). Displays an alarm in the browser user interface. Influences selection of the first-displayed status screen. Generates an SNMP trap (if configured). Triggers a GPI Output (if configured). The FS1-X can accept and route any audio inputs to any audio output. DB-15F: single connector provides four inputs and four outputs. See Appendix B for a connector pinout and GPI specifications. Cooled via two internal fans and side vents. Two independent power supplies, fully redundant, diode isolated.